Work for the future TeaFeathers art book, funded through Patreon! Here we have an Alecani hailing from the Sa’Dimali, a tribe of fierce desert dwelling Alecani and Pylura. They have a close relationship with snakes. Whether for food, companionship, or worshiped as earthly heralds of their revered snake spirits, they are a part of the Sa'Dimali's daily lives. This individual is equipped with the things an Alecani needs to go hunting for giant snakes; water skin to stay hydrated, various anti-venom vials in case of a bite, catch pole to safely handle snakes, and of course a snake skull earring (whose hollow fangs double as the injection mechanism for the anti-venom). Each month in which patrons vote for me to work on the TeaFeathers art book, I'll do a series of sketches and at least one full finished piece for the book. This month I’m working on an illustrated short story, which I’ll publish next month publicly. Want a say in which project I work on? Vote, get work in progress shots, and photoshop files of finished art work as a patron! This is amazing! And the concept of using a snake skull's hollow fangs to inject antivenom... that's awesome! I love the action that is in this image. The curve of the snake and the direct line of the eyes and staff, it's great! I love the highlights on the snake's scales and how the rest of the body fades in the background, it makes the characters seem to 'jump' out of the page more. Also the snake skull earrings are an awesome detail. The snake does not seem particularly pleased! Wow wow the scale is wonderful! Every time I look at your artwork I just sit there and just admire the amazing anatomy and shading and colors and... you know what, I just adore your artwork. Whoas is that a fox?? WITH WINGS?? I kind of love this a lot. That's awesome, I'm glad my art evokes that feeling/memory! Thank you! Wow that looks like a very epic struggle! Both creatures are quite beautiful, and I love the Alecani's expression and pose! How big are these cute little fox warriors? 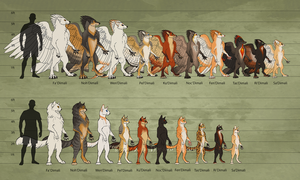 I'm super amused by this 'cause my fursona is a fox with eagle wings! It's really cool to see that someone else had a similar idea! I'd LOVE to see your character, feathered/winged canines come in so many interpretations! Awwwwwww it's tiny! That poor thing would be dwarfed by my sona's feral self. XD she's 6' tall at the shoulder! Is this book for some sort of tabletop thing? I can't afford to donate right now, but i may buy it in the future when it gets printed! I love these designs, they're awesome! The book's format is definitely going to similar to a tabletop player's guide, but without the rules! I want it to be both a guide to their world and filled with luscious art. My hope is to have it available for print someday, that's what I'm working towards. Patreon is getting me started on the beginning labor portions, and it would be neat to kickstart the bulk of the labor and the printing part. I'm quite a ways off of course, but at least I've started! She's honestly sadistic enough to find their fear of her funny, although she'd never actually hurt them. She's not the most sociable. >.>; I kinda really wanna inject her into the world you're creating now, though! X3 I'll have to wait for the book so i can create a version of her that fits in with everything! I look forward to it! If i have any spare spending money in the future, i will definitely donate! Depending on price, i might get a commission from you if ever they're open too. I love how you draw these guys and would love to one day see my girly in your style! Interesting critter with a creative defense mechanism. My writer mind can't help thinking about the situations she must deal with (I.E. the disgruntled looks during a rain storm). Actually, Getting more than a light misting in their fur is dangerous. Their fur is so dense that very little air moves through it. That means that water doesn't evaporate quickly enough and can cause their skin to rot or mold to form on the fur. The best real life analogy i have for their fur type is a Chinchilla which also can't get wet or the same thing will happen. If they are caught out in the rain, it terrifies them. They need water to live, but fear and respect it greatly so rain is actually kind of a natural disaster for them. If they get angry/stressed out enough they might be able to heat up their pelts enough to force the excess water to evaporate if it's only a little water, but being soaking wet is a death sentance. Wow. Sounds like they're well thought out. That's an awesome mechanism, the sweat glands that secrete flammable chemicals! I'm totally for cross-overs. For fun, I often imagine my Alecani in real life, or in movie or comic settings interacting with my favorite characters. I tend to open for commissions once per month, and I'm trying to fit in some affordable priced stuff like icons lately! I do that all the time with mine. Helps me understand my characters a little bit more. Funny thing is, I don't let genre stop me. I've had my fantasy werewolf having a debate with Commander Riker, and my sci-fi fox hamming it up with Draco. It's all about the characters, and their reactions to each other, including reactions in any abilities that may be involved. Thanks! I try to keep at least a little realism with all of my characters, even if their abilities aren't really natural. I saw Nym in your folder. I might draw her meeting my 'sona if you're okay with it! I will definitely keep an eye open for your open commissions. My hubby just got a job the past two weeks, so we have alot of bills to catch up on, but after that I'm sure i'll be able to save up. I would be honored to see such awesome art!